Well felt like that at work today as my name seemed very popular, not sounding like I am gloating or anything but well on it at the moment at work. Stand in line people as I know all the answers haha, yeah right but things have changed for me at work a lot over the last six months. Am I responsible, finally mature, dunno but with bonus coming up lets hope the real leaders of the company think so. Me and my friend went pub for lunch earlier and were randomly taking pictures of the world. Then it switched and we noticed how much affros seem to be popular these days. My haircut included haha. 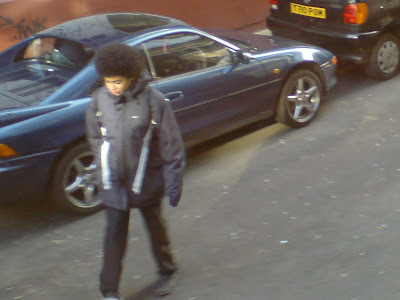 Some school kid was sporting a fairly sized affro and he took a picture, maybe to compare it with mine. No contest, mine is much bigger haha. The photo looks like something out of Michael Jacksons 'Beat It' though so we switched into Bo Selecta and walked about wearing one glove on each hand yelling 'Charmone' at each other haha. Tonight going to the usual places to have a usual night doing usual things. I love being usual ! !